Sharpie needed to elevate its brand profile to consumers and increase product placement nationally at Office Depot, Staples, Wal-Mart, Target, and Office Max. Develop a usage acceleration strategy by showing a wide range of Sharpie applications in traditional and unexpected demonstrations. The brand strategy was executed in television, online, and print. We added a sports marketing component culminating with the title sponsorship of the Independence Bowl. 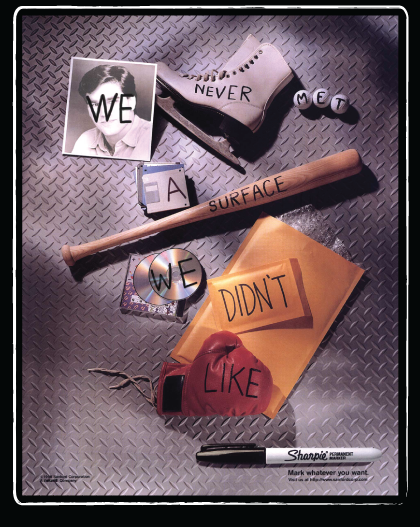 The campaign developed by this Chicago creative agency bolstered Sharpie’s position as the most recognizable brand in the permanent marker category. And contributed to the brand’s ongoing growth as Sharpie continues to enjoy its dominant position as the number one selling permanent marker in the world with a 48% market share.